Happy Monday and Happy MARCH!!!! I hope y’all had a fun weekend & are having good start to another week! I don’t know about you, but I am SO ready for spring!!! The title of this post might have given a little hint as to what I wanted to blog about tonight (it’s from a country singer Chris Young’s song called “Neon”). So have you guessed it yet?! 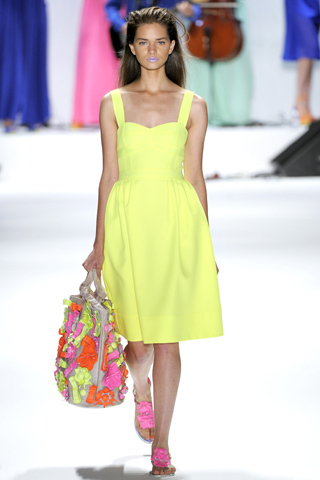 Yes, I wanted to share with you a little trend that’s huge this Spring: NEON! 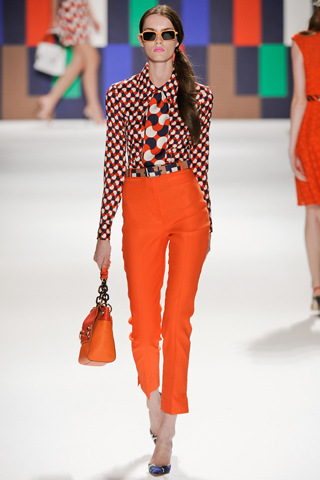 It was seen all over the runway for the Spring 2012 Ready to Wear shows…. Look at those neon accessories! Neon color blocking w/ yellow & orange. Pretty!!! The shades to keep a lookout for are orange, yellow, green and my personal favorite PINK! There are SO many ways you can wear neon….it just depends on your mood and how much attention you want to receive ;). So, for those of you feeling a little less adventurous…stick to ONE neon piece (I personally LOVE the idea of neon heels or accessories such as belts). However, if you are on the team “I love to make a fashion statement”, try neon color blocking!!! That’s right…pair your bright yellow skinny jeans with a hot pink blouse for a head-turning outfit! Personally, while I do love to make a fashion statement, I plan on sticking with neon accessories to ease this trend into my wardrobe (especially a neon BELT-that’s def on my list for my next shopping trip!). Thank you for reading!!! Have a good evening!